Looking for a quick pass to this content? Have no time to read a long blog post? Here is the slideshare that presents the below in an alternative format. Getting found is better than a cold outreach. The days of building lists and performing (cold) mailings/ calls to prospective clients are gone. It is common sense to apply a content strategy that make prospective clients find the vendors they want to work with. 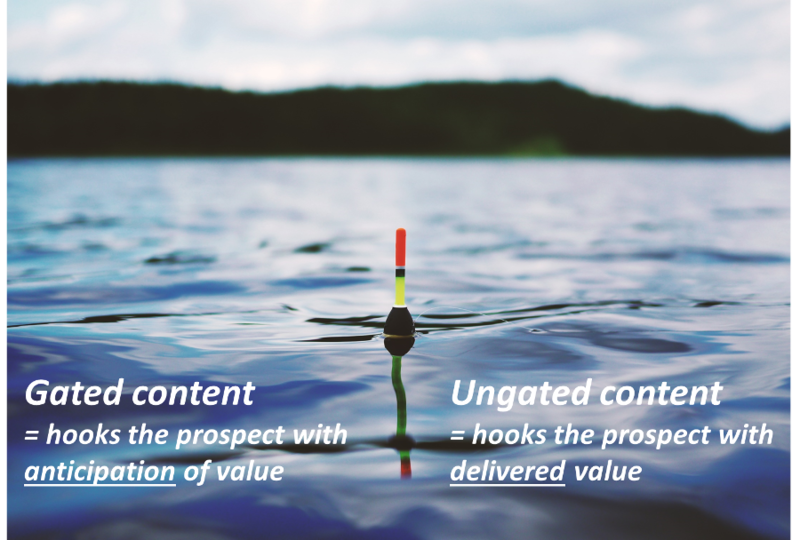 Content as lead generation currency. Once found, vendors and prospective clients exchange content versus contact information. Vendors then use the latter to "nurture" the lead. They do this by providing context- specific information throughout the buying journey. This results in a process in which companies share content on their website and in their blogs. This content has the purpose of creating appetite for more (value add content). The valuable content then gets hidden behind a form. A call-to-action (CTA) motivates the user to request the content. This brings him to a landing page that only markets the specific piece of content and contains a form. Once filled out, the form redirects the user to a thank you page, where he can access the content. With that, the user's contact details have made their way into the vendor's Marketing tools. From that moment of time, the user will receive more free information. Hopefully in an intelligent way and in an acceptable frequency. The graph below summarizes this process. As said, we relaunched our website. Actually, we used this change to question everything related to our "old" website in a 360° view. Layout, structure, content, message, positioning, everything. In that process, I stumbled across the above and asked two theoretical questions to my team. Do we follow an appropriate system of values? Let's assume that 100 people come to our website. They find our content interesting, and want to get more. So they click the CTA, end up on the landing page and see the form. 5 folks are so intrigued that they fill the form and thus read what we have to say. So: what is better? 100 people who read our content whom we do not know? This brought me to the next question. The only reason gating our content behind a form was to get an email address in exchange for the content. We did this as we wanted to nurture the lead. What, if people give a sh#! about our emails? If our email engagement rates would be insanely low, how would we answer the “100 vs 5” question? Of course: it makes no sense to raise questions and have no "hard facts" to answer them. Well, we use some proper inbound Marketing software. Hence, it was an easy task to gather some appropriate data points. Our PDFs (eBook, whitepaper, checklist) have – by far! – the best click-to-submission rate. 50% of all people clicking the CTA also fill out the form. This confirmed the proven way! Puh. This is damn good. We have a 20% open rate and almost a 4% click rate. Seems that we are capable of providing content that matters. The metrics above confirm that the proven and standard way of lead generation is a good fit for us. Nothing else to say. OK. Let's add a soft perspective to the hard metrics. Let's but ourselves into the shoes of the vendor (NETRONIC) and the website visitor. We have been content gating all the time. We do this, because we know that our content is valuable and we should not give away this value for free. We want the user to appreciate this value by giving us his email address in return. Also: as CEO and owner of the company, I pay Marketing people and I give them a budget. Isn't it fair, that I want my Marketing people to prove the return of this investment? What could be more appropriate than measuring Marketing qualified leads? And hence the impact Marketing has on our pipeline and revenue? Gating content eases me doing this math. "Ah. They gate their content. Must be precious to them. Seems they do not have much to offer (only rare things have a high value ;-). Because they value their rare content as precious, they want me to get locked into their CRM system. Why the hell do they believe they need to nurture me? Why don't they have confidence that I'll find them again next time I search again? (well, obviously because they do not have that much to share)"
In essence, following a proven way has made us taking care for the number of leads. What we did not take care for was if our users actually enjoy our content. Even worse: on the landing page, we only make a content promise. What, if the user fulfills his part of the deal (give his email address) and then we do not match our content promise? How motivated would he then be to receive further content from us? By now, I made two attempts to question the norm. The first based on numbers (and actual achievements). The second based on perception and psychology. Do you want to engage with your audience based on the anticipation of value or based on the delivered value? With these two ingredients, I am convinced that we are in a great position to ungate our content. I want everybody at NETRONIC to understand content as a magnet, and no longer as "Marketing currency". So, our relaunched website is full of free eBooks, whitepapers, videos, recorded webinars etc. Besides this, we give people the chance to opt-in into our content-specific mailing list. And we ask for contact details (still) when folks want to test our software, and request an in-person interaction with us. The rest is and will be ungated. I am confident that this is the right way forward ... for our visitors, for our customers and also for us. What do you think?